2. Spray & heat up frying pan, throw the broccoli in and cover for 3-4 minutes. They should be a bright green color. 3. 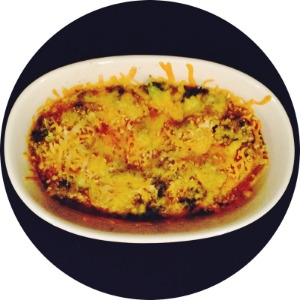 Butter a casserole dish, pour in broccoli and cover with shredded cheese. Generously. Sprinkle cayenne for some spice. 4. Bake @ 250 for about 15 minutes, until cheese is melted and turning golden brown. 5. Let cool and enjoy. Congrats, you're eating veggies that are actually delicious!